Carnivals are held all over the world as a time of parades, costumes, celebration and fun. Historically, carnivals were a time of festivity before the abstinence of Lent, but the spirit of carnival can be celebrated today in street parties and homes throughout the year. The word carnival is based on a corruption of the Latin 'carne vale' which means ‘a goodbye to meat’. Traditionally carnivals were times of excess where feasts were held to use up meat before the onset of the abstentious times brought on by the Christian period of fasting known as Lent. In the Middle Ages carnivals became times where the usual strict rules were relaxed and the world could be turned upside down: the poor were imagined ruling the rich, women commanded men and animals were pushed in carts by men. The tradition of dressing up and disguise relates to this time of licensed law and taboo breaking. Those who allowed themselves to behave badly or break rules during carnival were safe in the knowledge that their identity was truly hidden by their carnival costume or by the masquerade masks they wore. Traditionally carnivals were a time to indulge before the forced abstinence of Lent kicked in, so many carnivals are held in February but there are significant exceptions. For instance, in late August London’s Notting Hill is packed with revellers enjoying the bright colours, impressive floats and music booming from competing sound system’s speaker stacks. Brazil’s Rio de Janeiro carnival is all about spangled skimpy bikinis and the infectious rhythms of samba, whilst India’s Goan carnival ends in a rather more stately red and black dress dance, held by the Club National in Panajim. In Italy the Venetian carnival adopts masks that hide the face and cowls that hide the body, offering a rather more baroque interpretation of the carnival tradition. The Santa Cruz de Tenerife Carnival in Spain, once famously banned by Spain’s long-standing dictator Franco, is all about cross-dressing, clowns, and a surreal papier-mâché sardine burial accompanied by weeping mourners. 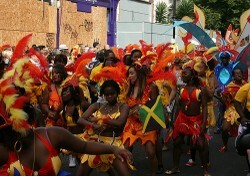 If you fancy hosting your own carnival themed party there are many options open to you. Stick the heating on high and get everyone to arrive in their bling swimwear – crank the samba up high, throw in a few balloons and feather boas and enjoy! You may prefer holding something rather more refined such as a masked ball using Venetian face masks and evening wear accompanied by some waltzes. If kids are involved, get a creative friend to volunteer to face paint – and as it’s carnival, adults can join in too. As the carnival tradition is to dress up, giving your party a theme can help your guests with their choice of costumes. Carnival appears in many guises all over the world – but all carnivals exist to simply let people eat, drink and be merry! Enjoy. Where would you most like to go for carnival? Find out which carnivals Guardian readers rave about. Ideas and inspirations for making your own carnival costumes. Hundreds of inspiring carnival photos. Carnivals are so popular because they are great excuse for adult to behave like children... We have great carnivals in Slovenia, some with very long tradition, so if you come around, don't miss it. @Andrea thanks :) I've seen videos of Argentinian Carnivals and they look fab! I must go at some point! Carnivals are so much fun! You must see Carnivals in Argentina, they rock! Really liked this article, sounds like fun!